He will not point you to the beach umbrella area. Despite the moans and groans of children heading back to school, or that perpetually pessimistic Facebook friend you haven’t seen in 17 years but yet still you haven’t hidden her cranky statuses from your newsfeed (self-torture is weird), summer is not over, people. Take a look at the calendar: It’s August! Who knew? As such, you might still want to go to the beach but perhaps, like Consumerist reader Bob, you need a few supplies. 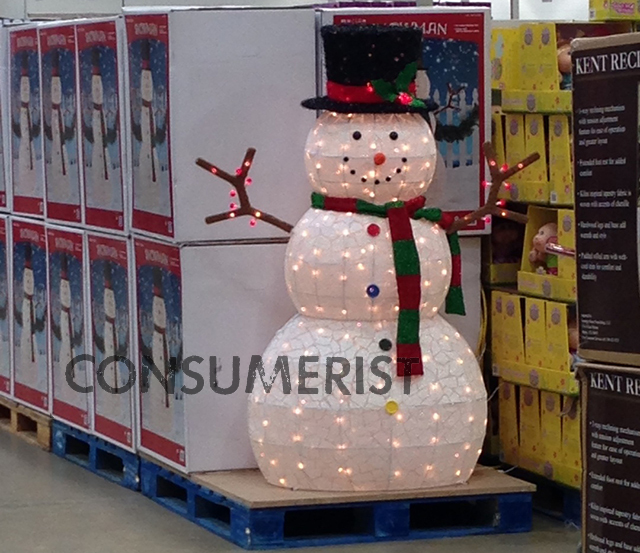 Costco might be on the side of the “summer is over” grumblers and naysayers, says Bob. He went to his local outlet in Virginia and was greeted by the smiling, light-up fellow we see above. “Went to Costco Monday looking for some beach supplies. I might be too late,” writes Bob. You’re probably right, Bob. Such a friend might be all about bringing good cheer, but everyone knows a snowman would be a horrible beach companion. Despite what the calendar says to the contrary, summer is over for many retailers and Christmas Creep is in full swing. Basically, there’s a snowman’s chance in hell (or on a beach) that you’ll find what you need, when you need it. Start looking for those beach supplies on Dec. 26, Bob. That could be the right timing.